When you want to enjoy great times outdoors in any weather, Pathfinder Charger is the way to go. 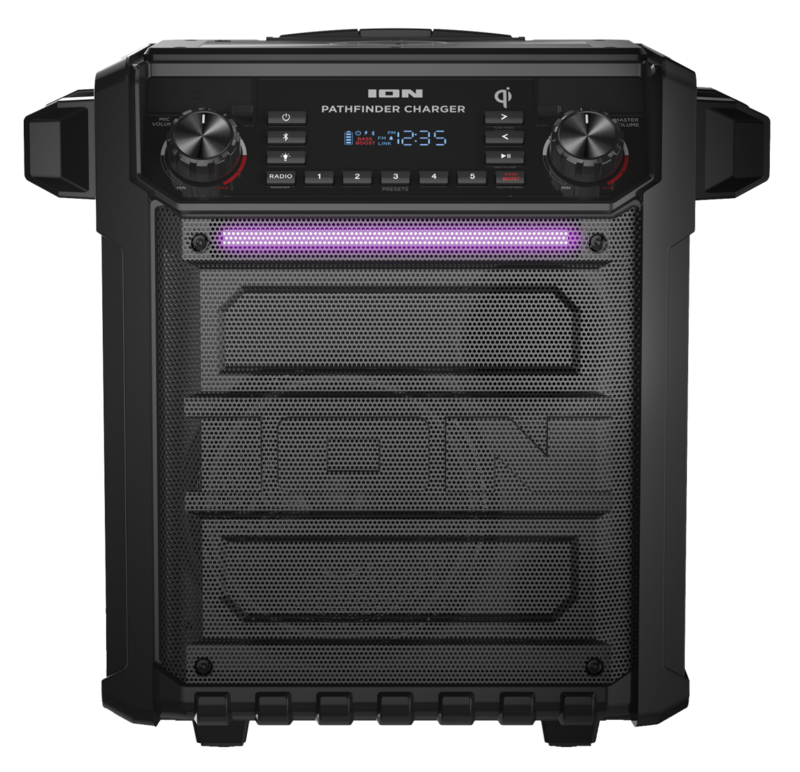 This rugged, water-resistant, rechargeable speaker streams your favorite music from any Bluetooth®-enabled device and pumps out great sound through its 8-inch 2-way speaker system powered by a 100-watt dynamic power amplifier. This article will answer some popular questions about the features and functionality of the Pathfinder Charger. What are the dimensions of the Pathfinder Charger? What is the water resistance rating on the Pathfinder Charger? How do I pair the Pathfinder Charger to my Bluetooth device? Does the Pathfinder Charger support NFC pairing? I can't get my microphone to work, is it broken? How do I set the clock on this speaker? How do I set the alarm on this speaker? Can I link more than one Pathfinder Charger together? What phones are compatible with Qi wireless charging? How can I tell when my phone is charging, and when it is finished? Where can I find further technical support? The Pathfinder Charger is 18.11" x 18.11" x 11.02" (HxWxD) and weighs 28.1 lbs. The Pathfinder Charger is IPX5 level water-resistant, which means it is ok to get a little wet. Technically speaking, an IPX5 rated device can withstand anything from light rain to splashing water, to even water jets (think super-soaker). Avoid any extended periods of wetness (i.e. leaving it out in the rain), powerful water jets, or submerging the pathfinder in water. To put the Pathfinder Charger into Bluetooth pairing mode, simply tap the Bluetooth button. The Bluetooth light on the display will begin to blink, confirming that it is ready to pair. On your Bluetooth device, search your Bluetooth list for the Pathfinder Charger, and tap the name to successfully connect your device. When connected, the Bluetooth light on the Pathfinder Charger display will remain solid. To disconnect your device from Bluetooth, tap the Bluetooth button once again, and the Bluetooth light will turn off, confirming that your device is disconnected. Note: If your Bluetooth device is requesting a password, enter 0000. Does the Pathfinder Charger support NFC? Yes! To connect via NFC, start by pressing the Bluetooth button on the Pathfinder Charger. With NFC enabled on your phone, tap your phone to the NFC logo on the Pathfinder Charger and it will connect to Bluetooth automatically. When charged fully, the Pathfinder Charger has an incredible battery-life of around 100 hours when used at a low or moderate volume level. Battery life may vary based on temperature, age, and volume usage of the speaker. I can't get the microphone to work. Is it broken? Be sure that the RADIO function is off. Connect the microphone and turn it on. Turn the microphone volume knob up to around the 3 O’clock position. Speak clearly into the microphone while slowly turning the master volume up. You should begin to hear your voice through the speaker. The Master Volume knob controls the output level for all the sources (Radio, Bluetooth, Aux-in, and Microphone). How do I set the clock on my speaker? Press and hold the Bass Boost button to enter the menu. Tap the Menu/Bass Boost button until it reads CLO. Use the arrow keys to select ON or OFF for the clock and then press the Play button to confirm your selection. Use the arrow keys to select AM or PM for the clock, then press Play to confirm your selection. Use the arrow keys to adjust the time displayed, then press Play to confirm your selection. When finished the screen will revert to the menu. Holding the Bass Boost button will return it to the main screen. How do I set the alarm on my speaker? Tap the Menu/Bass Boost button until it reads ALA.
Use the arrow keys to select ON or OFF for the alarm. Use the arrow keys to select AM or PM for the alarm, then press Play to confirm your selection. Use the arrow keys to adjust the time that you would like the alarm to sound, then press play to confirm your selection. To stop the alarm from sounding, press any button on the speaker. A Pathfinder Charger can be wirelessly linked to a second Pathfinder Charger so you can playback a Bluetooth source in Stereo. Only a Bluetooth source can be wirelessly streamed between the two speakers. Press and hold the Play/Pause/Link button to enter Stereo Link mode. Once a link has been established, the word LINK should appear in the display. Select which unit will be the master (left channel) by pressing and releasing the Bluetooth button. To disconnect the link between the two speakers, double-press the Play/Pause/Link button. The below list is of some of the most current phones that are Qi wireless charging compatible, however, it would be best to check your phones reference manual for compatibility. The Qi wireless charger has an LED indicator for charging. When a Qi-compatible smartphone is placed on the landing area on the top panel, a blue LED on the top panel will light and begin to fade in and out slowly to indicate that the smartphone is successfully being charged wirelessly. When the smartphone is 100% charged, the LED will turn off.